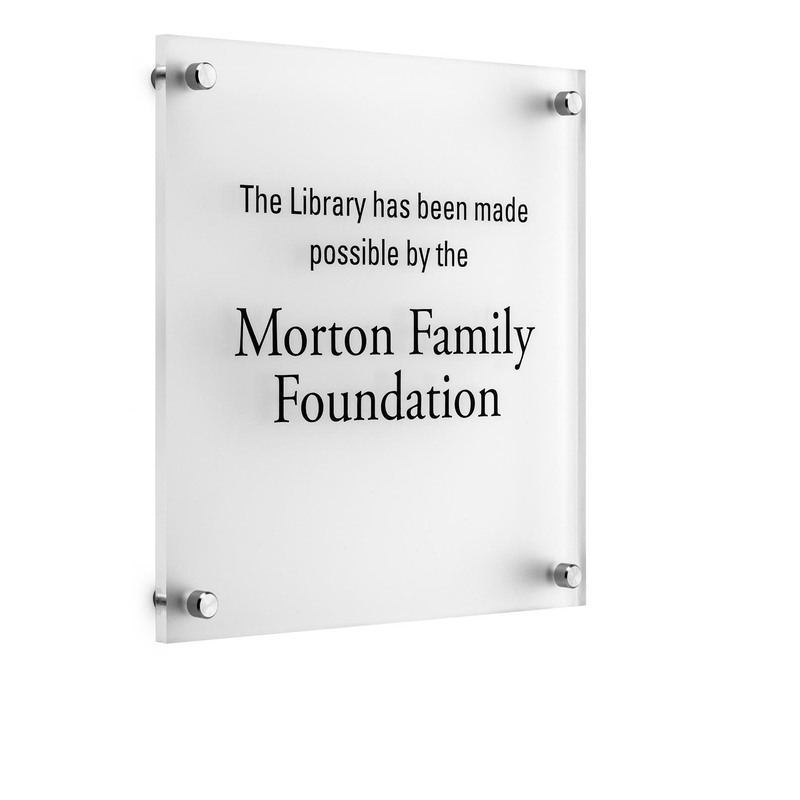 Moderna donor recognition plaques are made with ¼” clear or frosted acrylic with anodized aluminum standoffs allowing the plaque to be suspended off the wall by a half inch. The text is UV printed (print dries in ultra violet light giving it a more vibrant color). Be sure to pick dark colored lettering if the walls are a light color, or light colored type with a dark colored wall. This donor plaque can be used throughout your facility and paired with most of our donor wall options for a seamless look. Donor recognition plaques are a great way to bring attention to your capital campaign. It typically takes our designers 1-2 business days to create a design layout of your recognition wall plaques. This detailed shop drawing is submitted for your signed approval before payment is needed and production begins. Revisions are welcomed; we want to work with you to create the perfect recognition for your organization. Production of this wall plaque can take 2-4 weeks. If you are on a timeline let us know; we will work with your timeline and get your plaque finished for your event! Detailed instructions are included with every package. Use the pre-drilled holes in your plaque as a template, mark and drill with specified size holes. Insert anchors and hanger screws, and tighten the barrels to the surface. Place your plaque in position and thread on caps until snug. Watch this instructional video to see installation for this donor wall. We ship our products through UPS Ground, and can take 2-4 days to arrive. Fill out the form to receive a free design layout of your plaque. Our designers will take 1-2 days to customize your plaque with your fonts, logos, etc. No payment is needed at this time. Fabrication of your plaque(s) starts on your signed approval and payment; typically will take 2-4 weeks. Rush orders can be done. We use UPS and Fedex ground shipping, typically reaching your location in 2-4 days. 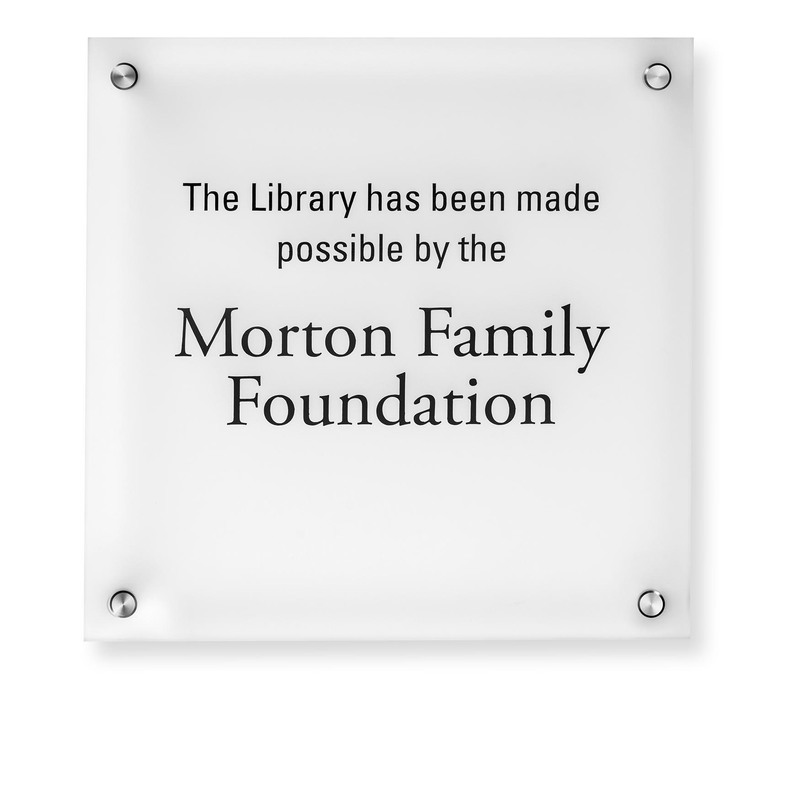 Clean, fresh, contemporary donor recognition plaques or memorial plaque solution. This simple design works equally well in a contemporary or traditional setting. Fill out the form below to see what your Moderna Plaque will look like; Please specify if you have desired font, logos, or color preferences. Use the form below to receive a design at no cost or obligation. Gary and I had an opportuniy to walk by the Surgery Family Room last week to view the donor wall. . . it is spectacular. it is so nicely designed and positioned to be viewed by so many doctors and families. thank you for all of your efforts on behalf of the endowment you are the best. The Board of Directors of Alder Springs Deaf and Blind Community want to thank you for the attention and service that we received on our donor plaques and donor wall. First, the plaques are beautiful. The color is exactly like the sample and they arrived in a very timely manner. No matter how often we changed or added plaques, your patience and attention to detail was impeccable. Second, our donor wall was almost 400 names and we received the same great service. No matter how many times we changed a name or added names, you were so patient. Finally, the best thing about our plaques and donor wall is that our donors themselves are proud of them. We are so grateful to have found DonorSigns.com and even more so that we had Stephanie working with us. She promised that we would have our recognition before our Open House and everything was here just as she said. Thank you, from our Board and our Community, for you patience, attention to detail and for taking great care of us.